What have the Palestinians done for the USA? Here I go again. But this time I do not intend to discuss all the reasons that a Palestinian state carved out of the historic homeland of the Jewish people would be a bad thing for what would be left of Israel. No, today I want to talk about what the Palestinian Arabs have done for America — and what a Palestinian state might do. I recall the event well, and I also remember that the political aspect of it was not widely discussed. Sirhan was described as a “mentally unstable Jordanian.” But his statements and writing before and after the murder clearly evidenced his political motive: the Palestinian Cause. The admission comes 33 years after James J. Welsh, then the National Security Agency’s Palestinian analyst, saw a communication intercepted from Arafat to his terrorist commandos in Sudan. There were also many ordinary Americans who lost their lives as a result of Palestinian terrorism. Here is a page that lists American terror victims. Other than those who died on 9/11, the overwhelming majority — hundreds — were murdered by Palestinian Arabs or by other terrorists on behalf of the Palestinian Cause. Palestinians did not invent the airline hijacking. There have been hundreds of hijackings going back to at least the 1950’s, by criminals, political dissidents, mentally ill individuals and simply desperate people. But beginning with the Dawson’s Field hijackings of 1970 by the PFLP, carefully planned hijackings to achieve political goals became one of the favorite tactics of the Palestinian Arabs, and the idea seized the imaginations of terrorists and would-be terrorists, especially Arab and Muslim ones. Neither did the Palestinians invent suicide terrorism, but in recent times, their exploits in this area have been remarkable. 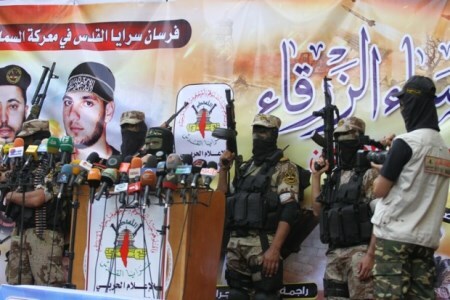 Between 1989 and 2008, there were at least 160 suicide attacks by Hamas, Fatah, Islamic Jihad, the PFLP and other Palestinian gangs, causing more than 800 fatalities and countless injuries. The much-vaunted Tamil Tigers (137 suicide attacks between 1987 and 2009) come in second. So what do you get when you combine hijacking and suicide terrorism? Of course, the Palestinians didn’t do 9/11, much as they cheered the perpetrators on that day (and yes, the footage of Arabs dancing in Gaza streets was real). But isn’t it likely that the success of these techniques in the hands of the Palestinians served as an inspiration for the architects of 9/11? Leaving all of this aside, could a Palestinian state possibly become a valuable ally or trading partner for the US (like, for example, Israel)? Hardly. For one thing, Palestinians don’t like us. In a survey of attitudes toward the US in 39 countries, the Palestinian Authority came in tied for third from the bottom with Egypt (only in Jordan — which has a majority of Palestinians itself — and Pakistan were we liked less). Israel was second from the top, slightly behind the Philippines, despite the recent pressure from President Obama. The Palestinian Authority is non-democratic, without an independent judiciary or most of the institutions required for an even partly free country. Freedom house rates both Gaza and the PA as “not free.” Its ‘president’ has overstayed his term by 5 years. It is ridden by crime and corruption, and home to an alphabet soup of terrorist gangs. Palestinians have been the largest recipients of international aid for decades, and much of this aid is simply stolen or used for weapons and explosives. What kind of state could it become? Rather than try to bring ‘Palestine’ into being despite the cost, the US should is oppose the creation of yet another oppressive failed state, a base for terrorism and an economic and human rights disaster. WASHINGTON — President Obama, after avoiding a hands-on role in Middle East peacemaking since the setbacks of his first term, plans to plunge back into the effort, his advisers said this week, starting with an urgent appeal to Prime Minister Benjamin Netanyahu of Israel. When he welcomes Mr. Netanyahu to the White House on Monday, these officials said, Mr. Obama will press him to agree to a framework for a conclusive round of Israeli-Palestinian peace negotiations that is being drafted by Secretary of State John Kerry. Later in March, Mr. Obama is likely to meet with the Palestinian president, Mahmoud Abbas, to make the same pitch. The goal, officials said, is to announce the framework, a kind of road map for further talks, by the end of April, the nine-month deadline that Mr. Kerry set last summer for a final peace deal between Israel and the Palestinians. In response to the failure of the Kerry mission — Kerry is an object of derision in Israel, while Mahmoud Abbas has referred to his proposals as “insanity” — the administration seems intent on salvaging its latest effort to push Israel out of the territories by bringing in its biggest gun. This raises the question, yet again, of American priorities. In a world containing Syria, Ukraine, Nigeria, Iran, Venezuela, etc., how can forcing Israel to commit suicide be so important as to require direct presidential involvement? We all have our theories. The top American diplomat reportedly offered for Abbas to form a Palestinian capital in the neighborhood of Beit Hanina, not all of East Jerusalem, as the Palestinians have demanded. Kerry also suggested that Israel keep 10 settlement blocs as part of any territorial exchange, according to Al Quds, the most widely read Palestinian daily, on Wednesday. The Jordan Valley would not be part of a future Palestinian state, Palestinian sources told the paper, nor would there be an international force stationed there. And Kerry reportedly demanded that the Palestinians recognize Israel as the homeland of the Jewish people. Only someone who believes that Abbas and his PLO are actually interested in ending the conflict and living at peace with a Jewish state could propose such ‘radical’ concessions! Yasser Arafat would turn over in his grave if Abbas were to agree to such a framework. The Palestinian narrative, which is explained every day in their media and schools, implies that all the land between the river and the sea belongs to them. The magnanimous Abbas is prepared to agree to establish a state today in all of Judea and Samaria, including eastern Jerusalem, rather than insisting on all of the land at once. But by no means will this end the conflict, which will continue by diplomatic and legal means, as Abbas has said in English — and by armed struggle, as Palestinian media say daily. Kerry apparently didn’t understand this. Far better deals, including the re-division of Jerusalem and the evacuation of the Jordan Valley, were rejected by the PLO in 2001 and 2008, mostly because of the refugee issue (recognizing Israel as the homeland of the Jewish people means, among other things, that the descendents of refugees do not have a right to ‘return’). The heart of the impasse between Israel and the PLO has always been the same. Although it is not unimaginable that Israel could have reached an accommodation with the Palestinian Arabs in the early 1990’s, it could not have done so — as events showed — with the PLO, whose very reason for being is opposition to Jewish sovereignty. Unfortunately, the PLO, Hamas and even more extreme elements have been able to suppress any moderate elements, and to establish their rejectionist ideologies as preeminent through their control of media, culture and educational systems. Today there is no partner for an agreement that leaves Israel able to defend herself. The President will have to bring more than his pretty face to the negotiations if he wants to get the PLO to sign onto some kind of deal. And unfortunately, from what we can glean about his beliefs, particularly when we consider his background and associations, there is reason to think that he will lean more in the direction of the PLO than Kerry apparently has. The NY Times report seems to suggest that Obama will apply more pressure to Israel to make an even more PLO-friendly deal. It’s hard to see how PM Netanyahu can give up on the only issue that matters. It’s possible that the ‘framework’ will be so ambiguous as to be vacuous. Nevertheless, such an agreement can give more legitimacy to the PLO, and foreclose Israel’s option to end the process and take unilateral action. We’ve had the good cop. Now we are going to get the bad cop. I was having a discussion with a friend about J Street, the recent BDS resolution at UCLA (which was defeated, but still…), disturbing trends in college Hillel groups, and similar examples of why some of the worst enemies of the Jewish people are Jews — especially young Jews. The question came up, as it always does: why? The Oslo Syndrome, a coinage of Kenneth Levin in his book of the same name (which I discussed here): a disorder in which the sufferer, a Jew afflicted by powerlessness in the face of Jew-hatred, decides that the problem resides in himself rather than the Jew-haters. Thus he regains the power to affect the situation, by changing himself so that he stops being an object of hatred. This can take the form of trying to remove Jewish characteristics (nose jobs), renouncing religious observance, and of course opposing the Jewish state. The joke is on him, of course, since the Jew-haters will continue to hate him regardless. Left-wing credentials. Since the 1960’s, when the KGB explained to Yasser Arafat that he would have more success with Western public opinion if he presented his cause as a national liberation movement for an oppressed people, rather than as the racist and genocidal project that it really is, it has been de rigeur for anyone aspiring to a leftist identity to adopt anti-Zionism as an article of faith. The need became even stronger with the Durban conference of 2001, in which Israel was equated with apartheid South Africa. Many Jews are attracted to left-wing or ‘progressive’ politics, and need the credentials to be accepted there. Since the anti-Zionist position is often disguised as a moral concern for human rights, ending ‘oppression’, anti-racism, etc. (the double standard associated with its application to Zionism confirms that it is in fact a disguise), its adoption provides an emotional boost for susceptible individuals — and young Jews, especially those brought up in liberal religious and political traditions, are very susceptible. Academic indoctrination. The large proportion of college teachers with left-wing politics, along with activist Middle Eastern students and ‘Middle East Studies’ programs, has created a strongly anti-Zionist atmosphere on many campuses. In addition, the influence of ethnic and gender studies in which politics and academics seem to have merged has made it more acceptable for teachers to use their classrooms for political indoctrination. Students strongly want to ‘belong’, and to fight the current is to risk ostracism. Together these factors have created loci of Israel-hatred like Evergreen State College. The conventional wisdom. Jews are people like anyone else. They read newspapers, watch TV, listen to the radio. Here in the US, some of the most popular media among Jews — the NY Times, NPR, MSNBC, etc. are strongly biased against Israel. In many countries — certainly in the US — political leaders are anti-Israel. Even if a person tries to avoid it, he can’t help getting it by osmosis. Some time ago, a friend who is definitely pro-Israel said to me “if only that Netanyahu weren’t so stubborn about the settlements, there could be peace.” When I asked him why on earth he thought that, he didn’t know. To a great extent, these forces act on the emotions, and only peripherally by reasoned argument. Even the media coverage, which could be seen as describing facts, correctly or incorrectly, is often crafted for its emotional effect. As Jonathan Haidt argued in his insightful book The Righteous Mind: Why Good People are divided by Politics and Religion (which I wrote about in more detail here), judgments of right and wrong are based on ‘intuitions’ — innate triggers of emotional responses — and only later justified by rational argument. This explains why it’s so hard to persuade someone to make this kind of judgment by citing facts and giving logical reasons. These are some of the reasons Zionism is losing support among Jews, especially younger ones. In a forthcoming post, I will suggest ways to overcome them. “The Israeli leadership is shirking its calling,” [MK Moshe Feiglin (Likud)] said at the opening of the session, during which he called for Jewish freedom of worship at the site where the first and second Jewish temples once stood. Rabbi Shlomo Goren, IDF Chief Rabbi at the time, opposed the decision and wanted to construct a synagogue on the Mount. Although it is commonly thought that Goren also wanted to blow up the Muslim holy places, it is almost certain that this is a politically-motivated lie (see Shalom Freedman, Rabbi Shlomo Goren: Torah Sage and General, ch. 37). This was once-in-a-millennium opportunity. 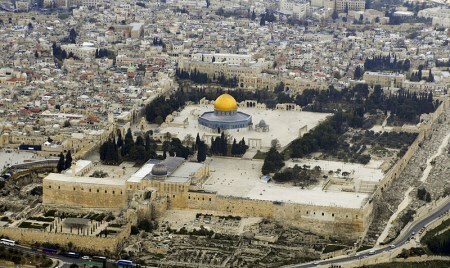 The Muslims understood that they were defeated, and would have had to deal with Jewish religious rights on the Mount, especially when they it became clear to them that they too would be able to pray there and that their structures would not be destroyed (I’m sure in the first days, they fully expected it — it’s what they would do, after all). But Dayan prevailed, and the chance was lost. Since then, the Wakf — as anyone could have predicted — has exercised its authority in ways intended to weaken Israeli sovereignty. For example it has ignored Israeli laws regarding safeguarding antiquities, digging in the area and discarding material of great archaeological significance, especially when it might suggest a historical Jewish presence there. On a regular basis, riots and other violence are incited by the Islamic Movement, Hamas or PLO officials on the pretext that Jews are ‘storming’ the Mount, preparing to destroy the mosques, or even merely praying there. The Arabs claim that the Second Intifada began because Ariel Sharon dared to visit it (in fact, the Intifada was carefully planned in advance; but the fact that Sharon’s visit can be used to justify a murderous uprising is significant). What a combination of cowardice and ignorance! But that’s the Israeli Left. There is really no good reason that Jews should not be allowed to share this holy place with Muslims, especially since many Jews died in order to secure the city (even though Dayan, like Gal-on, might have preferred to see it remain in Arab hands). It’s ironic that Israel, the Jewish state, takes pains to provide freedom of worship for Muslims while denying it to Jews. We know Facebook is the Evil Empire of the Web. Its tentacles are everywhere; it is intrusive and exploitative. I admit that I always feel like I need a shower after visiting Facebook. No more. A friend pointed me to this vile, Jew-hating page in Facebook: Jewish Ritual Murder. What could be a more blatant example of hate speech, than a page dedicated to the vicious libel that has incited countless pogroms? “Ask Jewish ritual murder to remove this page!” Damn, why didn’t I think of that? I like the part about “community standards.” What community has standards that approve of telling stories that incite violence, even genocide? None that I want to belong to. I’m gone from Facebook. Now I can go back to taking only one shower a day.